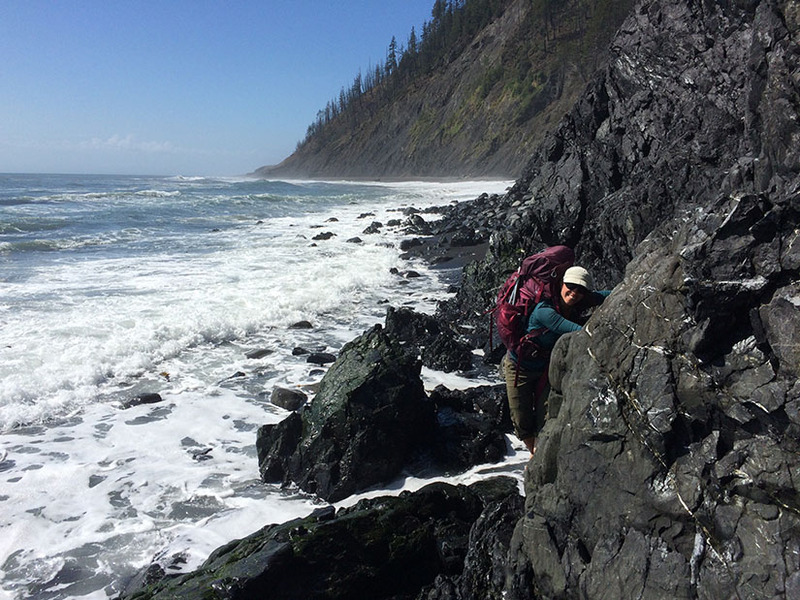 The Lost Coast is the most rugged, undeveloped stretch of coastline in California. There are no highways or major roads in the area. 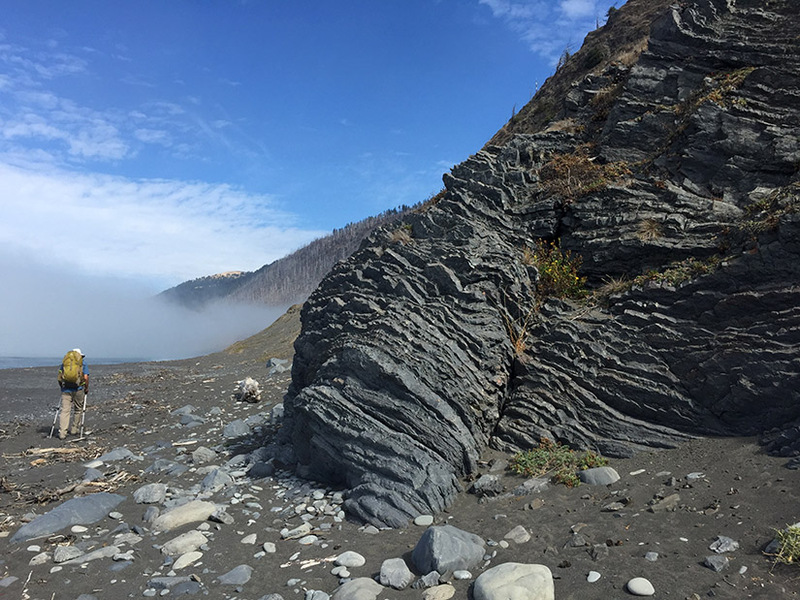 It was named the “Lost Coast” after the region experienced depopulation in the 1930’s, but the name still seems appropriate today considering the isolated nature of the place. 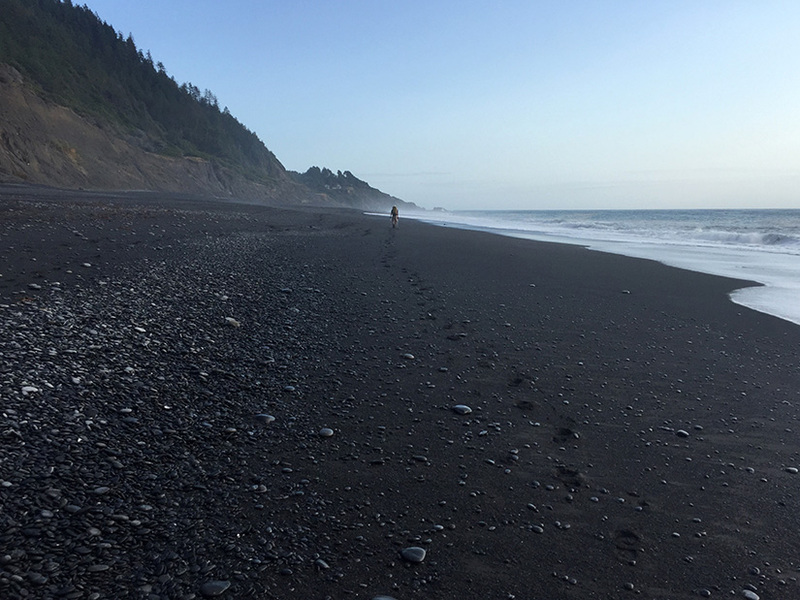 Trail Overview: The Lost Coast Trail follows the shore from Mattole River (north end) to Black Sands Beach in Shelter Cove (*south end). It’s 24 miles in length with very little elevation loss/gain. Most people thru-hike the trail from north to south in 2 to 4 days. The trail is part of the King Range National Conservation Area and is managed by BLM. 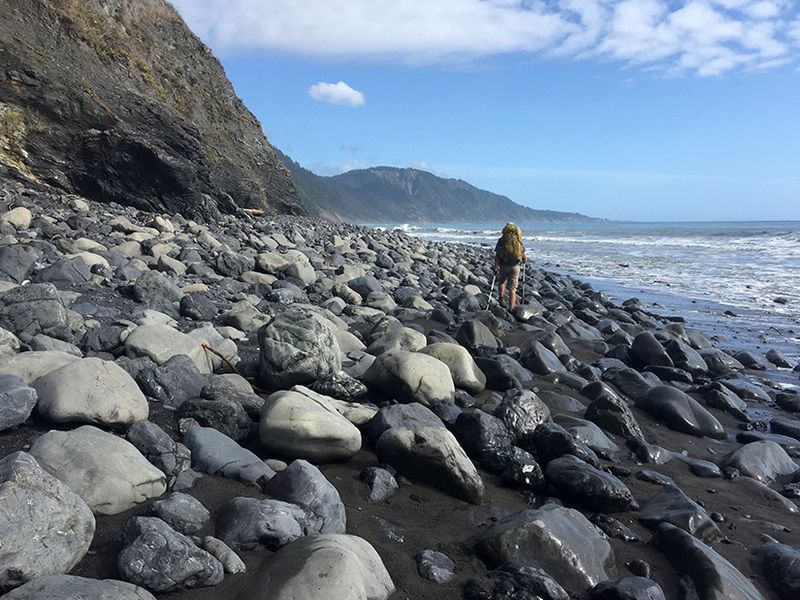 *Many Lost Coast hike descriptions fail to mention that the trail actually continues south of Shelter Cove for another 20+ miles. This lesser-visited section is part of Sinkyone Wilderness State Park. 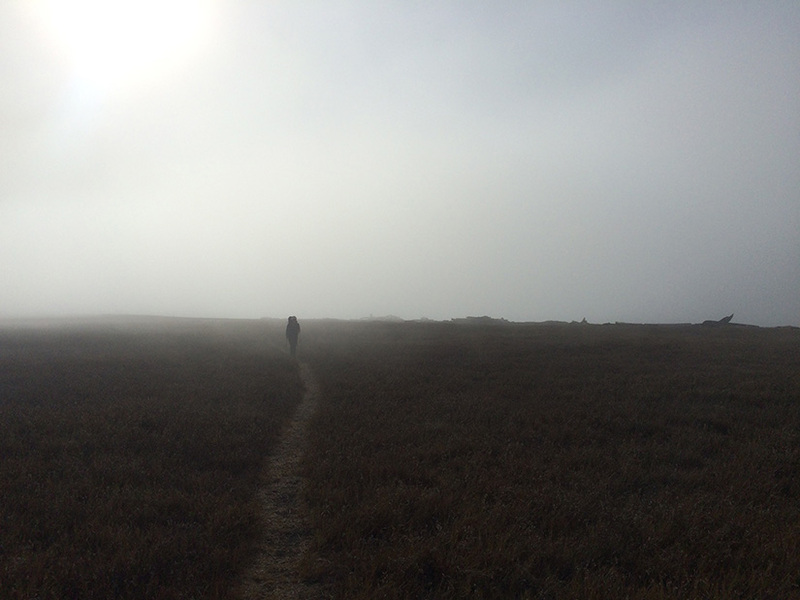 Hopefully someday we’ll do a complete end-to-end hike from Mattole to Usal Beach, 57 miles total. Parking and Transportation: Many people park in Shelter Cove, take a shuttle to the northern end of the trail, then hike back to their vehicle. Parking is available at either end of the trail. The drive between trailheads takes about two hours. 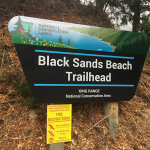 Shelter Cove: There is a paved parking lot with restrooms and a nice overlook at the Black Sands Beach Trailhead. Google Map link to trailhead. The town of Shelter Cove has a general store and several small hotels. 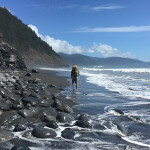 Mattole Campground: The northern terminus of the Lost Coast Trail is at Mattole Beach. The parking area is next to the first-come-first-served campground at the end of Lighthouse Road. The lot is unpaved but there are restroom facilities. Google Map link to trailhead. Shuttles can be arranged by contacting Lost Coast Adventures at (707) 986-9895 or the Lost Coast Shuttle at (707) 986-7437. These are pricey options and need to be arranged well in advance! Permits are required. 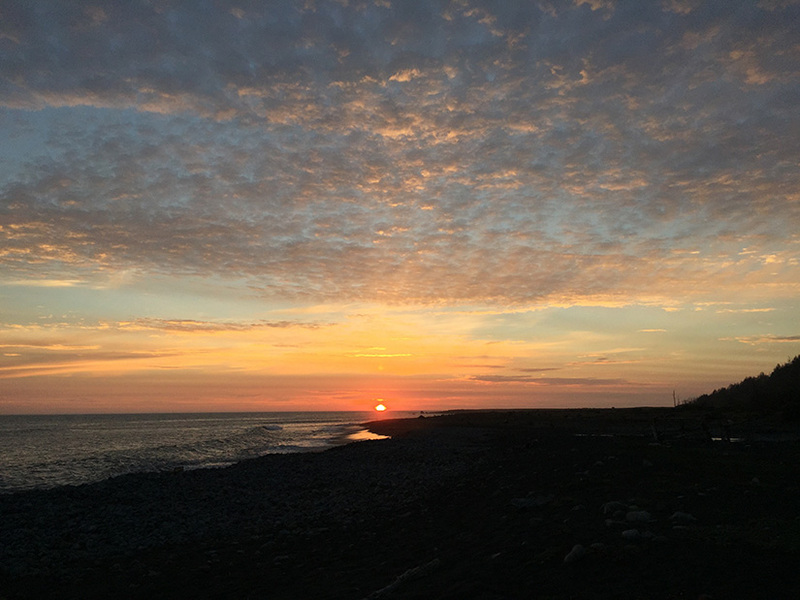 As of January 9, 2017 permits must be reserved through Recreation.gov and there is a quota of 30 to 60 persons per day (depending on the season). Maps: We used the Wilderness Press map and it was basically worthless (missing trails, missing water sources, poorly drawn contours, and generally lacking detail). If you plan to stick to the shoreline, you won’t get lost but you do need to know where the water sources are. The BLM trail map is much better. 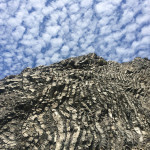 If you plan to leave the LCT and hike some of the other trails, I recommend printing your own map with CalTopo. Tide charts are absolutely essential. I printed my own tide table using NOAA’s tide predictions for Shelter Cove. The ocean here is not to be messed with: rip currents, strong undertow and rogue waves make the water unpredictable. Survival in the water is limited to about 20 minutes without a wetsuit. Don’t attempt to swim and never turn your back to the ocean. Bear cans are required! We saw lots of bear prints in the sand. 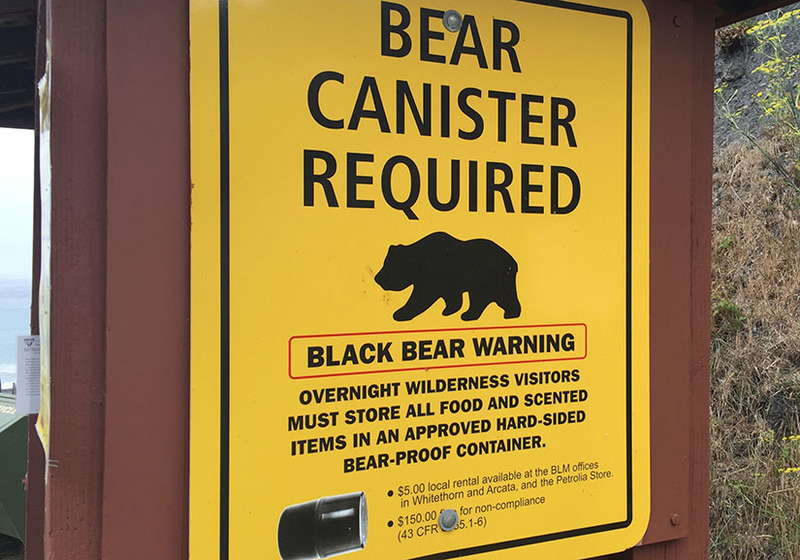 It may be possible to rent a bear canister at the Shelter Cove General Store. Contact the store for more info. 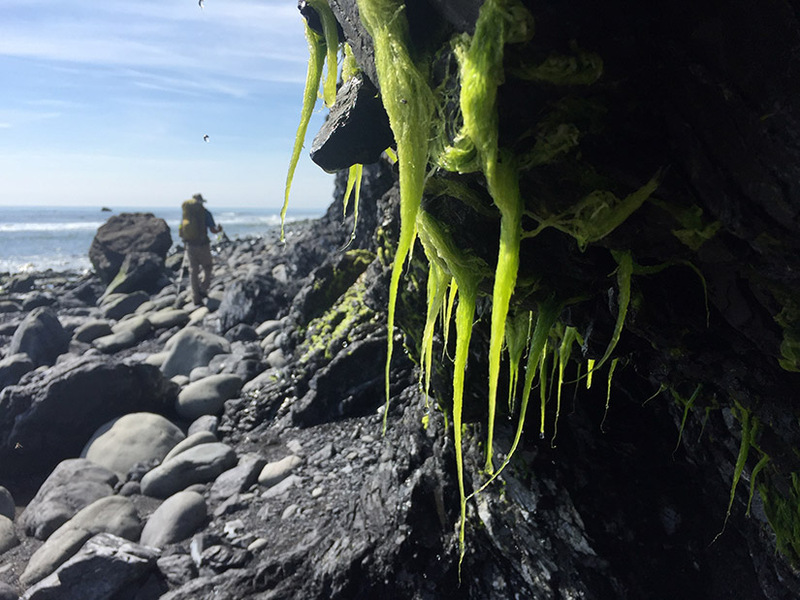 Weather: The Lost Coast averages 100+ inches of rain in a normal year. Even if you don’t see a drop of rain, the fog can produce significant moisture overnight. Come prepared with a rain fly and a pack cover. Trail Description: I didn’t get around to planning this trip until a few weeks before we were set to leave. The shuttle was already full for the day we wanted to start our hike. To make matters worse, the Horse Fire broke out and closed the entire trail a few days before our trip. It was looking like we might have to cancel altogether. Then just as quickly as it had closed, the trail reopened! We still didn’t have a shuttle but we thought, “to hell with it,” we’ll hike the whole thing as an out-and-back. We decided to start in Shelter Cove and hike north. Our turnaround point was the Punta Gorda Lighthouse, so the northernmost 2 to 3 miles of Lost Coast Trail are missing from my description. 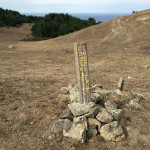 On our return, we took a detour high up on the ridge above the ocean, following the Cooskie Creek and Spanish Ridge trails. 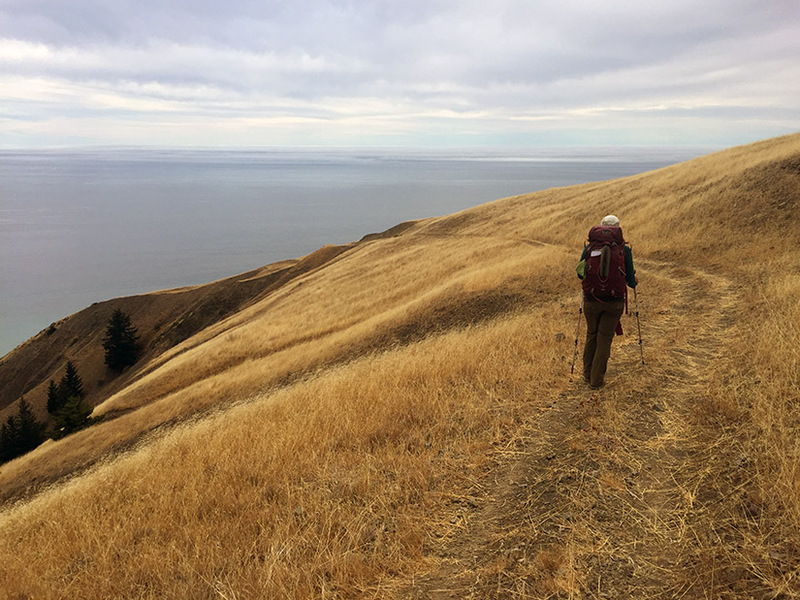 As a result, the route described here has twice the mileage and far more elevation gain/loss than your average Lost Coast Trail thru-hike would require. After the long 5 hour drive to Shelter Cove, we began our hike at around 11:30 am. 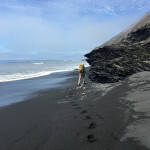 Tough beginning – the tide was high so we walked on cobbles and soft dry sand. The fog was kind of depressing. Our day turned around when the sun came out and we reached a few areas where walking was easier. Cal Fire was still fighting the Horse Fire in the steep terrain above us. 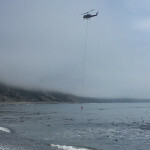 A helicopter continually dropped down alongside the trail to fill its bucket with seawater before disappearing again. We reached a section of trail that is “impassable at high tide” but fortunately the tide had receded by the time we got there. 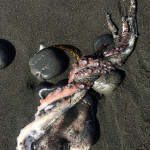 We saw lots of dead stuff including one deer leg (really weird), an octopus and a beached whale. We set up camp at Big Flat. It had taken us about 5 hours to walk 8.5 miles – we’re slow hikers on cobbles and dry sand. 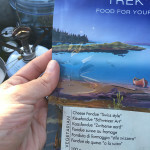 We made a Swiss Fondue backpacking meal, purchased during our last trip to Switzerland. It was disgusting. Despite the failed dinner, we shared some wine, watched the sunset and enjoyed the evening. Our day started out easy. We hiked past the Big Flat airstrip and found a wide trail up on the bluffs that took us most of the way to Randall Creek. 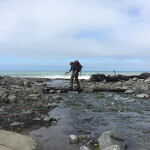 The four miles between Randall Creek and Sea Lion Gulch are considered “impassable at high tide.” We had good timing and the tide was on its way down when we began this section. We walked over a lot of cobbles. It was hot and the terrain was very tiring. Halfway through the “impassable” section we reached Cooskie Creek. We were both very excited to jump in and swim. I spotted what looked like a log a little further upstream. Thinking there might be a good swimming hole behind it, I went for a closer look. I quickly figured out the “log” was actually the carcass of another beached whale. This effectively crushed any desire to jump in the water, so we continued on our way. 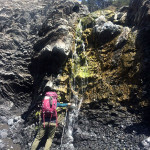 We reached the aforementioned awful rockslide about 1/4 mile before Sea Lion Gulch. 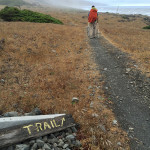 Hikers are supposed to take the Cooskie Spur trail up the hill, then detour back down to the beach via a short connector trail. There are signs for southbound hikers but because we were heading northbound, we were not aware of the detour. We proceeded to scramble through. One of the crevasses in the middle of the slide smelled like death. 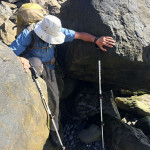 We carefully climbed over it and made it safely to Sea Lion Gulch. The trail becomes easier between Sea Lion Gulch and the Punta Gorda Lighthouse. 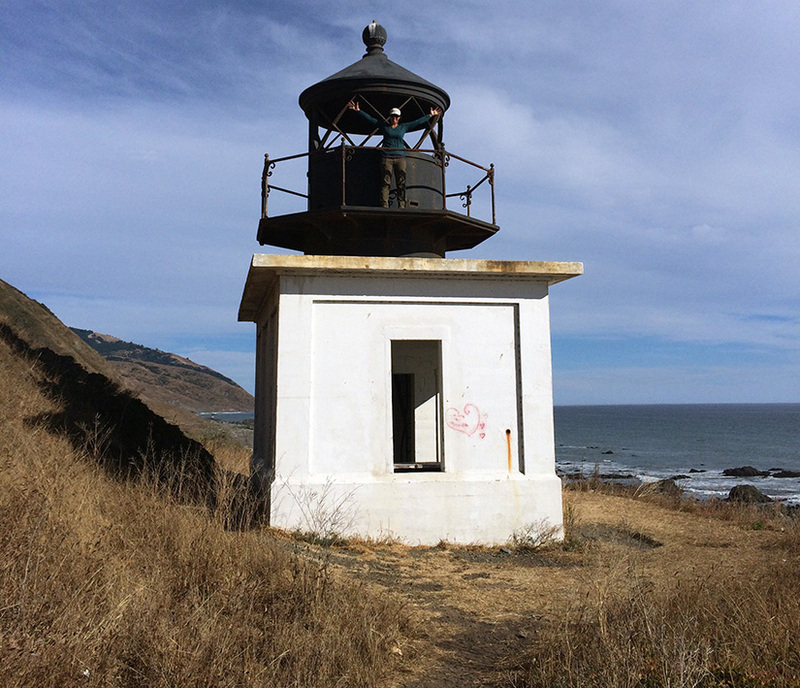 We spent some time snapping photos in the abandoned lighthouse, then set up camp at Fourmile Creek nearby. The creek is a trickle but we were able to get water from it. One Nalgene bottle has a little shrimpy critter (sea monkey?) in it that the Steripen failed to kill. I’ll use that bottle for cooking rather than drinking. I soaked my feet in the ocean because after 10 hours of hiking, they hurt. Tomorrow we’ll turn back the way we came and head south. Last night was warm. The moon was bright and the ocean seemed loud. Woke up a few times but still slept nearly 10 hours. We were back on the trail at 8:30 am. 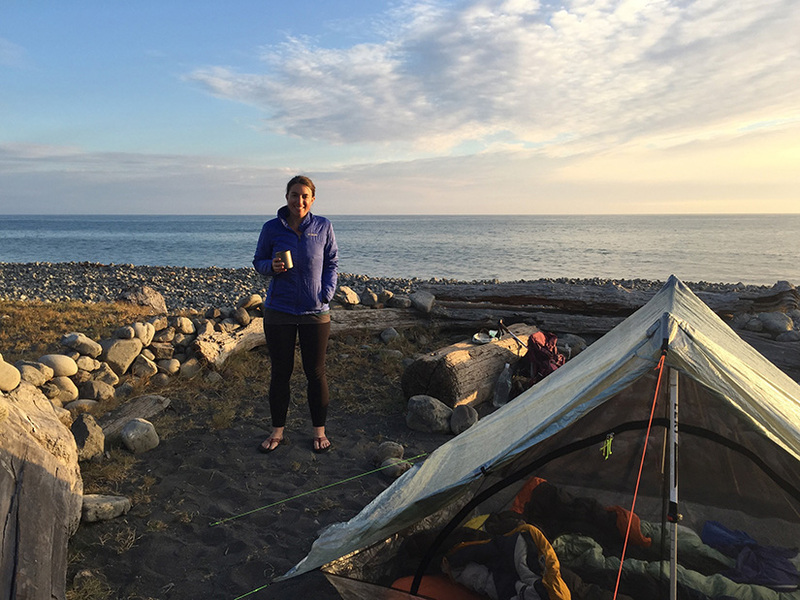 We passed a few other camps – most peoeple were waiting for the tides to recede before heading out. We planned to hike the ridge high above the beach so we would not be affected by the tides today. We bypassed yesterday’s rockslide area and reached the Cooskie Spur Trail. We began climbing, up 800-ft through tall grass. Then just as quickly we dropped back down 800-ft to Cooskie Creek. 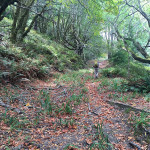 A big landslide had wiped out most of the trail but we were able to follow our GPS as we bushwhacked down the hill. We picked up the real trail again on the other side of the creek. From Cooskie Creek, we climbed forever. Up over 2000-ft through dry meadows and dark forests. We saw three hunters somewhere near the top, but otherwise no one all day. I was exhausted by the time we reached the Spanish Ridge Trail and we still needed to descend the 2000-ft back down to the beach. Hiking down the Spanish Ridge Trail. 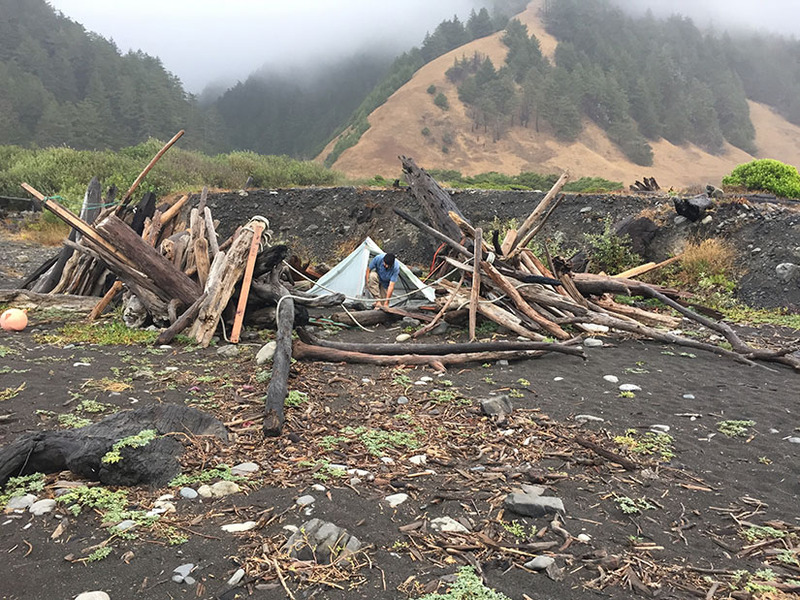 When we did finally reach the ocean, I picked the first campsite we came to: a quirky little driftwood fortress on the beach next to Spanish Creek. There are rock cairns and piles of collected sea urchins all around us. We both went for a quick “swim” in Spanish Creek before making dinner. 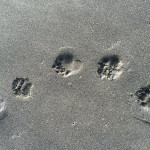 Rob spotted some bear tracks in the wet sand next to our camp. I’ll try to not to think about that as I go to sleep. Got very little sleep last night. A gusty wind picked up as we went to bed. Sometime around midnight it began raining so hard I thought the tent might collapse. 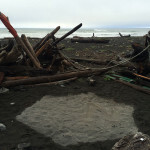 The tent did indeed partially collapse because we had staked it in sand without enough reinforcement. Rob got up and tied the guy lines to heavy rocks while I held the tent in place. Lesson learned: over-reinforce the tent because you never know when the weather might turn. My fear of bears was gone but I began worrying about the creek, the high tides, and the potential for landslides. Yes, I am always worrying about one thing or another. It didn’t help that we were set up somewhere along the extreme-high tide level and in a river wash. Logic told me it would need to rain for a lot longer before Spanish Creek gave us any trouble. I did eventually sleep for a few short hours. Lesson #2 learned: choose campsite locations wisely. Emerging from the tent in the morning after the storm. We awoke to blue sky peaking through the clouds. 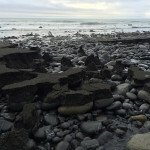 Several cairns had been knocked over by abnormally large waves. Spanish Creek had breached its sand dam and was flowing in to the ocean. Two hunters with day packs walked past our site before we broke camp. Apparently those tiny cabins scattered along the coast do get some use! 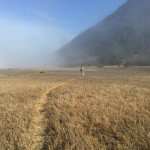 Fog settled over us as we made our way to Big Flat. The path was flat and easy and we covered 7.5 miles before noon. We made a hot lunch of pesto mac and cheese. It was kind of awful – the pesto packet was a salt bomb. At least now I know which brand of dehydrated pesto to avoid. The tide was still high when we reached the “impassable” section of trail to the south of Big Flat. The fog cleared and we basked in the sun while waiting for the tides to recede. Eventually we got impatient and continued on. I packed away my boots and got wet up to my knees. The “trail” somewhere along the “impassable” section. We walked barefoot for a while, but put boots back on when sandy stretches gave way to more cobbles, somewhere around Shipman Creek. It was a long day, but we reached the car before the sun was down. Walking on logs is easier than walking on cobbles. If you’re at a camping store in Switzerland, do not be tempted to buy this. Leaving Big Flat in the morning. 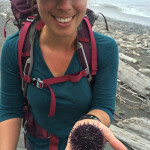 Look I found a sea urchin! Rob running around the point between waves. Filling my hat with water to stay cool. Climbing through the rockslide that we were supposed to bypass. Camped near Punta Gorda Lighthouse. 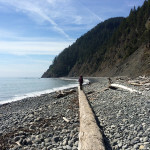 Off the Lost Coast Trail and on the Cooskie Creek Trail! Somewhere along the Cooskie Creek Trail. 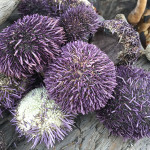 We found many more sea urchins. Spanish Creek after the rainstorm. There was a sand berm here the day before. Only 6 more miles to Shelter Cove. 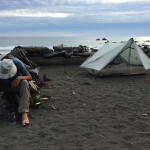 The Complete Lost Coast | Leor Pantilat’s Adventures – Great photos of the LCT including the rarely-visted southern section between Shelter Cove and Usal Beach. 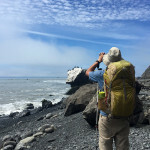 Get Lost on the The Lost Coast Trail | Appalachian Trials – Kenny Howell’s photos along with useful tips/info on the trail. 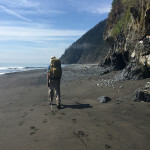 The Lost Coast Trail – SoCal Hiker’s description of this trail. Another great adventure…sorry the cuisine didn’t turn out so well. Maybe bring sushi rice for the “Uni” next time. Shipped past that section of coastline for 30+ years, but never set foot on land. Now I know that it’s as inhospitable as the sea to the west of it. And bears AND a rising tide??? Not a good combination…thanks for sharing your adventure guys…nice work! It’s been a long 35 years since we did it, with a Club backpack trip in May, Memorial Day weekend. Always sought to do it again, but never anyone, ever. They tried to run the trip, but all failure, as I seem to discern. I fondly look back at my photos and website post, remembering the London Broil that I grilled on the beach using driftwood fires. I was once looking at a day hike one way of 25 miles, but no takers. Maybe someday, someone will wish to do it, and contact me, but I doubt it. The enviro hiking club wants money to run it, by me, and that for them, “Hiking is work, and they’re not getting paid.” Now that I’m further away for a drive, I doubt that my second time will ever arrive, but I’m so glad that we took what hikers to do it, for free, no permit required, and for a few dollars gas sharing for the carpool ops that we provided! Your tent appears to be a Zpacks Duplex or Triplex? Sounds like it fared okay as long as tied down to rocks rather than stakes in the sand? Any trouble with blowing sand sneaking into the tent and disrupting sleep? Hi Eric. Yes – it is the Duplex! This was our first trip with it. We plan to take it on the PCT this year. It definitely kept us very dry in the storm, despite needing to be re-staked in the middle of the night. It was really just user error on our part, but staking in sand is just kind of tricky. We did not have any trouble with sand sneaking in to the tent. I think the bathtub floor and storm doors are more than enough to keep out the elements. The only downside of the tent is the crinkly sounding cuben fiber. It was pretty loud in the wind, but the material apparently gets less noisy over time. Thanks for the info! I have the Triplex and have been very pleased with it but have never used it along a beach yet. 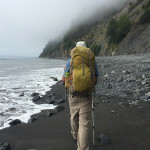 Looking forward to the Lost Coast end of May.